Mickley Plumbing and Heating is proud to install and service quality Rheem products and service you can depend on. We pride ourselves in exceptional customer service. Call Mickley Plumbing and Heating to schedule a service appointment or for a free, no-obligation consultation to determine the perfect system for your home or business. Mickley Plumbing and Heating has been servicing Knox County and surrounding areas with quality Rheem products and service you can depend on. Mickley Plumbing and Heating is proud to sell and install quality Rheem air conditioning and heating products and also services all major brands of equipment. Keith Mickley, purchased the business in 1995 from Bob Durbin after working for Bob 16 years. His wife of 36 years, Sherri, and Daughter-In-law, Shelby, manage the operations side including scheduling, billing, and payroll. One change he has noticed over the 30 years is a higher demand for comfort. “People don’t build as basic a home as they used to. Homeowners are willing to spend more for conveniences and comfort.” Service Technicians Russell Mickley, Keith’s brother, and Jim Schopfer came from Durbin’s as well. Keith’s sons, Eric and Brad, completed HVAC and Business degrees from the University of Northwestern of Ohio and The Ohio State University respectively. They were active in the business growing up and are now Co-Owners of the business with their parents. Gary Mickley, Keith’s brother, brings 25 years of construction and mechanical experience to the business. Gary’s son, Clayton Mickley, is now an active service technician, as well as, Kenny Mizer and Nick Miller. Mickley Plumbing and Heating is part of your community. Some of the organizations we have donated service to include the following: Hospice of Knox County, Habitat for Humanity, Knox County Agricultural Society, Care Net, St. Lukes Church, Danville and East Knox Athletic Boosters as well as numerous youth programs. 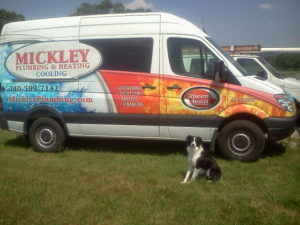 Mickley Plumbing & Heating is actively involved in serving Knox County.